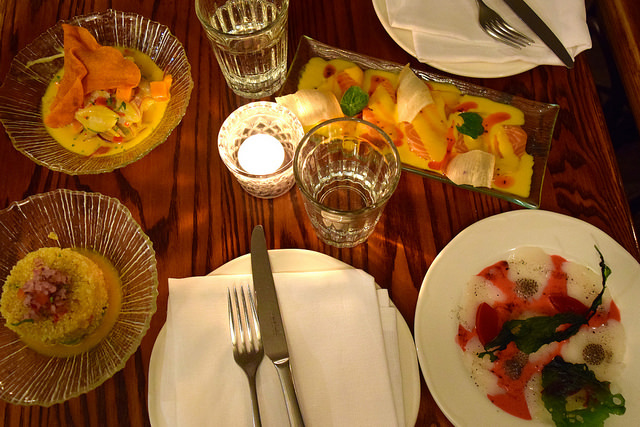 For Tuesday night’s after work dinner Sherin and I were craving Peruvian food, so we booked a table at somewhere I’ve been wanting to eat for ages: Ceviche in Soho. 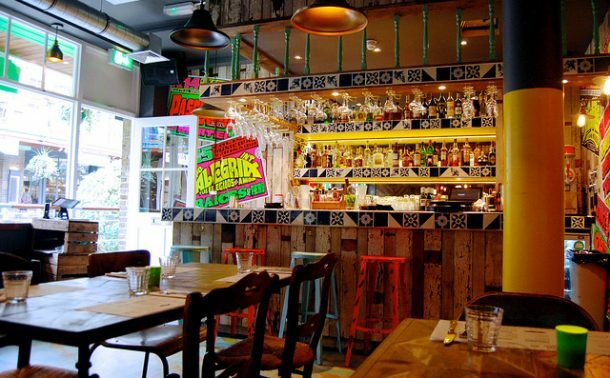 Senor Ceviche in Kingly Court remains one of the best meals we’ve had together, and I was a massive fan of Ceviche’s sister restaurant, Andina in Shoreditch when I brunched there a couple of Summers ago. So, we settled in for a couple of pisco laced cocktails, a tonne of small plates and lots of different types of ceviche, swimming in tigers milk. While it would have been nice for our cocktails to arrive before our food, they were still pretty wonderful when they did arrive. 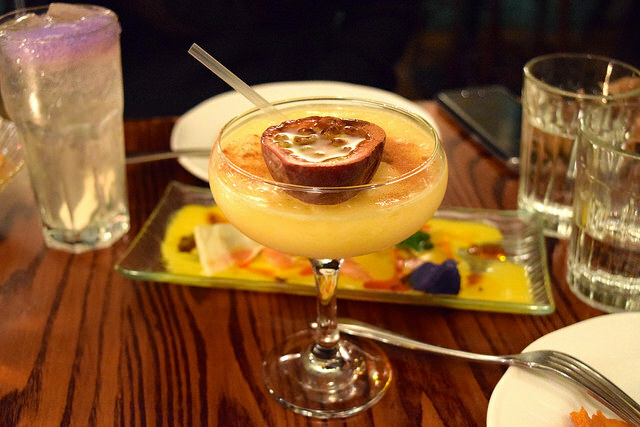 I had ‘Thor’s Passion’, made with ginger infused Barsol pisco, passion fruit puree, apricot liquor and Swedish punsch, topped with a passion fruit half and a dusting of cinnamon. 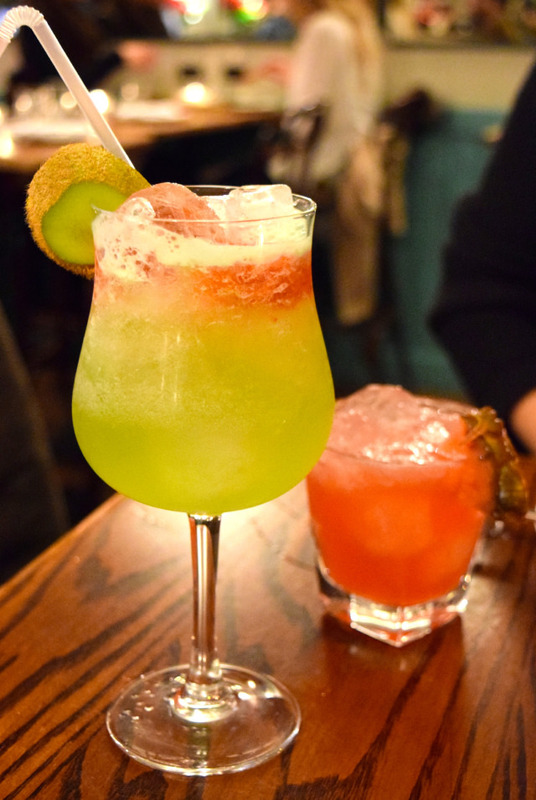 It was a frozen cocktail, which was fun, and while I thought it was average at first, as the cinnamon started to mingle with the fruit flavours, I found it was a really enjoyable, complex drink. 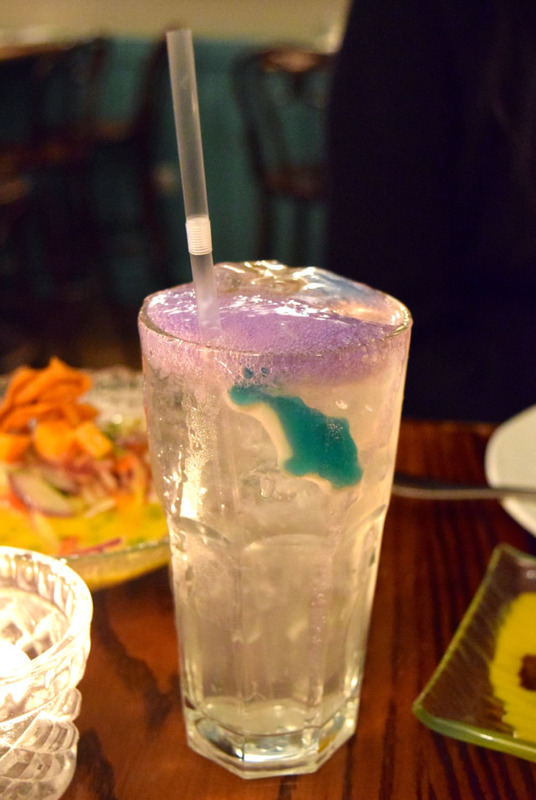 Sherin had a drink that had both the fun and flavour factor: Shark Ahoy! Made with 1615 Torontel pisco, Dictador Orthodoxy gin, Jack Rudy’s elderflower tonic, Double Dutch pomegranate and basil, with blue tea foam bubbling over the top, this wonderfully refreshing, frosted cocktail was topped with a mad (but delicious) slime which must have been the blue tea foam. And look at that adorable gummy shark inside! Shall we get started on the ceviche? 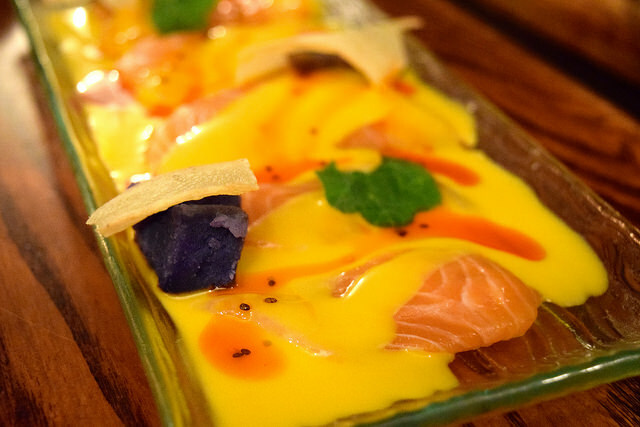 This is our personal favourite, the Tiradito Apasionado: a ceviche of sustainable salmon, passion fruit tiger’s milk, purple potato, chia seeds, cassava crisps and nasturtium leaves. The passion tigers milk was fresh and slightly spicy, the salmon light and sender. And how pretty does it look on the plate? 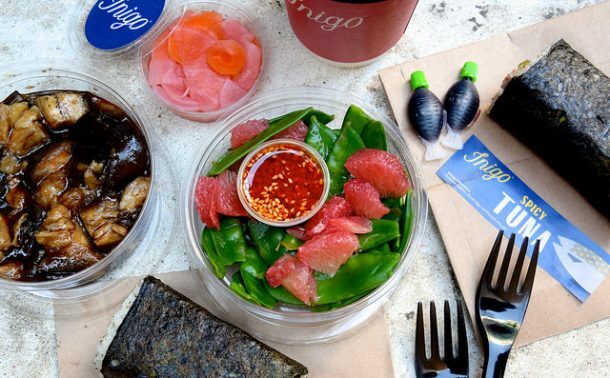 If we’d had enough room in our stomachs to re-order, this is what we’d ask for. 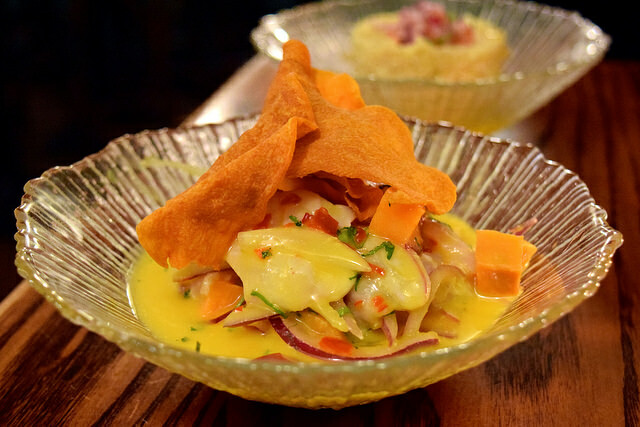 Because the hand dived scallops at Lima London is one of my favourite plates of food in the world, I always order the scallop ceviche in any Peruvian restaurant. 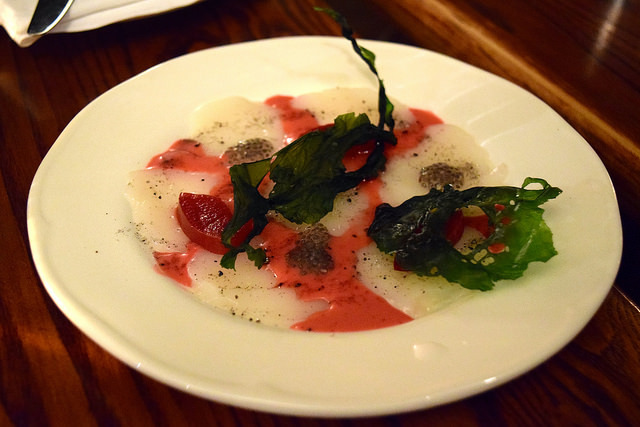 This is the Nuestro Secreto, a hand-dived scallops tiradito made with hibiscus tiger’s milk, chia seeds gel, charcoal salt and pickled green plums. This was really interesting both in the texture and flavour department. It was delicious, but I’m not sure I’d be ordering it again over the chance to try some other ceviche type options. 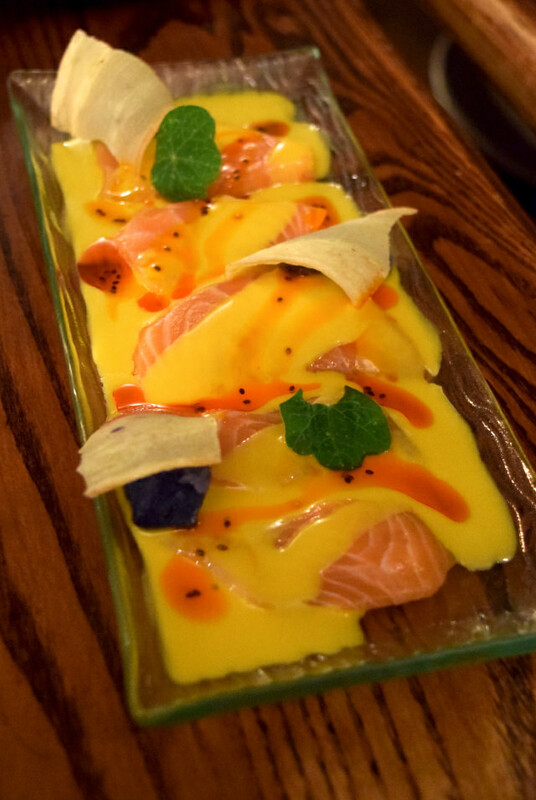 No visit to any peruvian restaurant is complete without a dish of their house, sea bass ceviche. At Ceviche it is the Don Ceviche: fresh sea bass ceviche in amarillo chilli tiger’s milk, limo chilli, sweet potato and red onions, a dish the restaurant is famous for. 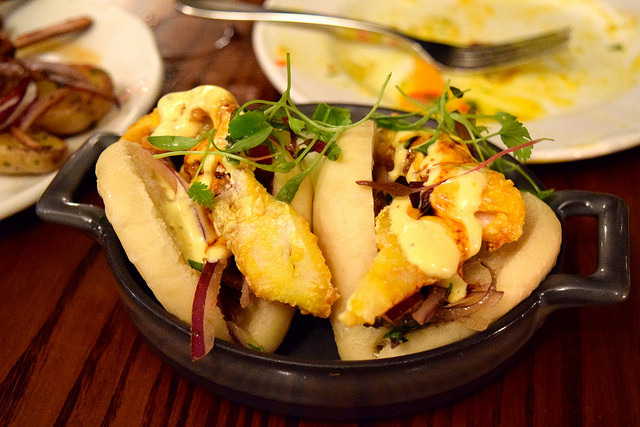 It is a light, fresh, more-ish dish which you should order as part of your spread. 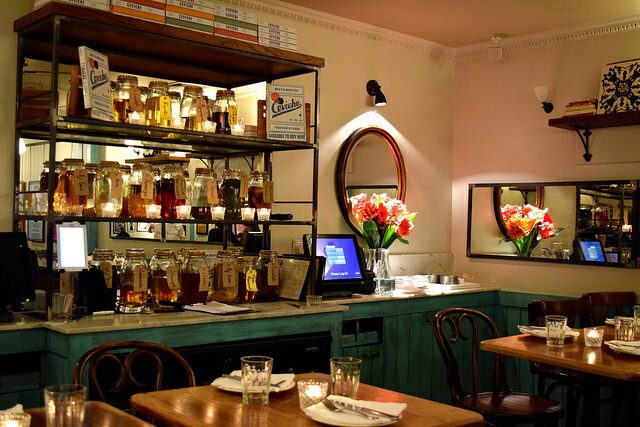 However, I think if you head over to Ceviche’s sister restaurant, Andina in Shoreditch, their house ceviche far outstrips this one. 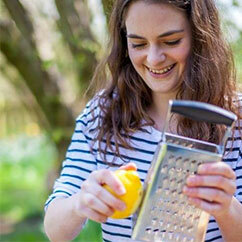 It is lighter, brighter and has a good bit of crunch to it. 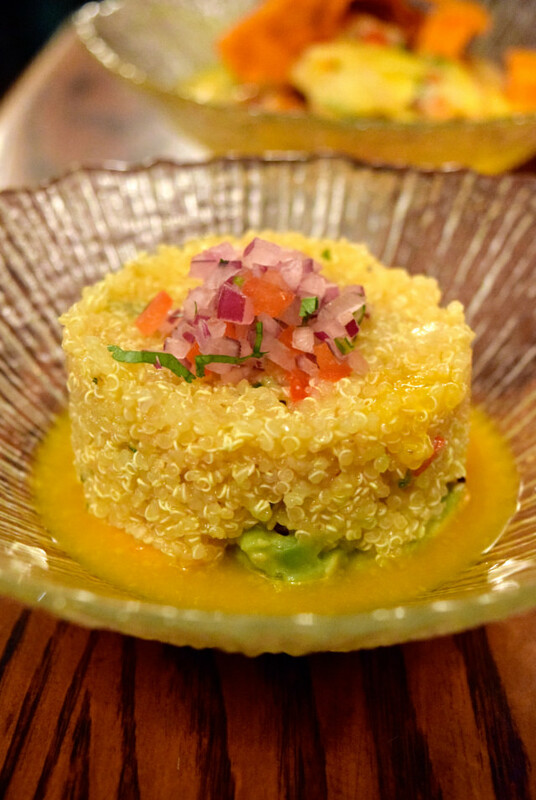 Surprisingly, one of my hands down favourite dishes at Ceviche was one of their vegetarian, side salad options: the Ensalada de Quinoa, a white quinoa salad with tomatoes, avocado, butter beans, coriander, lime and limo chilli vinagrette. It was light, fresh and deliciously more-ish, with the creamy green chunks of avocado and butter beans hid as little bursts of flavour and texture within the quinoa. I’m not usually a quinoa person, but this is fantastic. 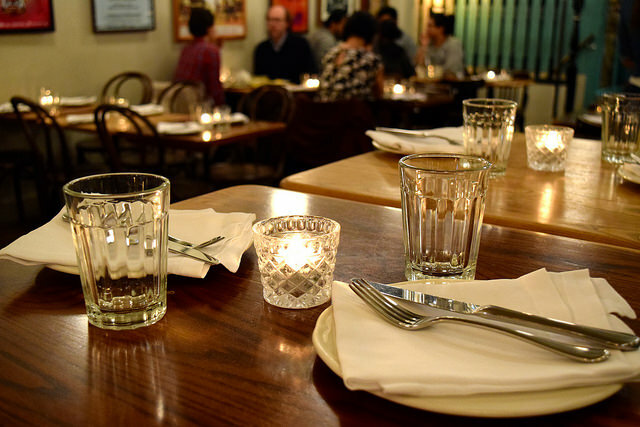 They’ll ask you if you want to order any rice to go with your ceviche, but go for this instead. 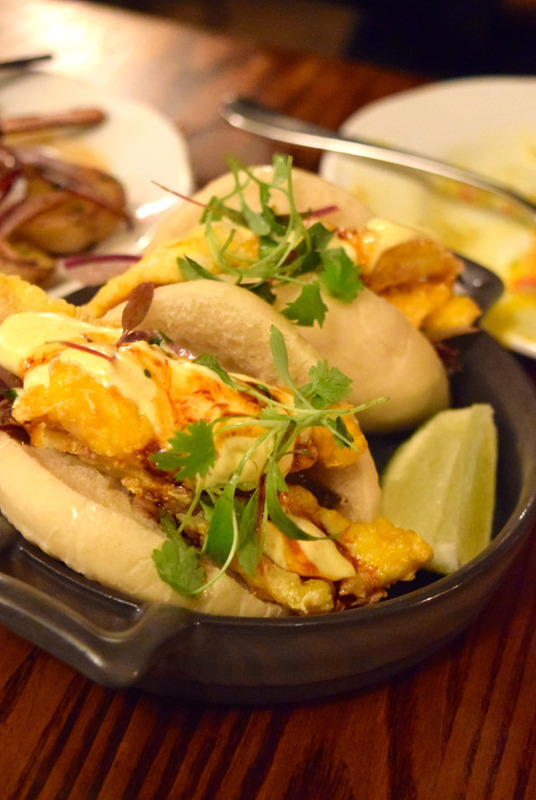 Moving onto the hot dishes we have my other favourite from the meal, the Jalea Steamed Buns: two steamed buns stuffed with deep fried sea bass and salmon, salsa criolla, amarillo chilli sour cream and kecap manis. Every mouthful left you wanting more of crisp, flavourful fish, incredibly complex soured cream and fresh micro herbs. Order at least one of these each, I promise you that you won’t regret it. 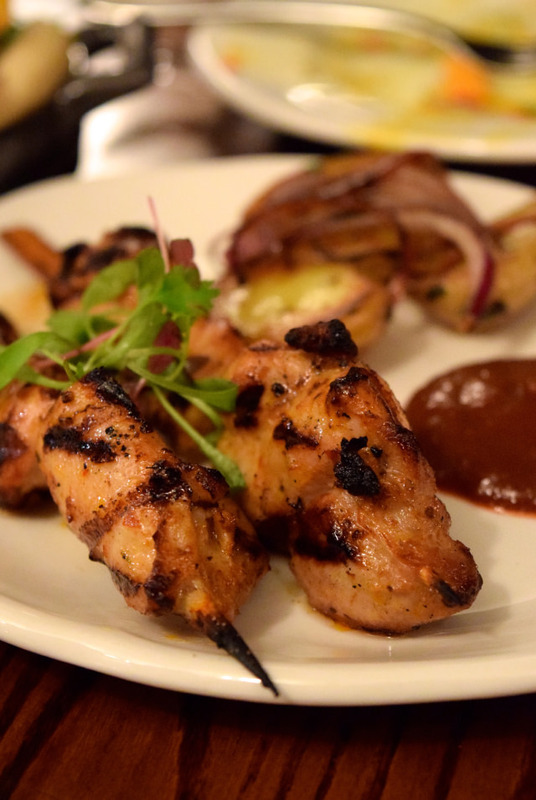 Whenever Sherin and I go out for dinner together, we pretty much always order something with chicken to share. 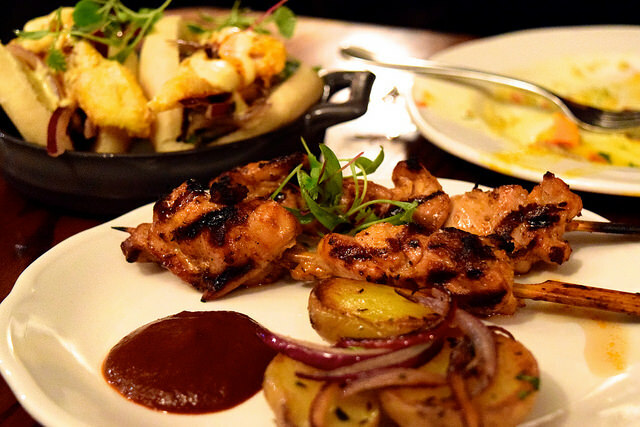 We went for the deliciously moist and smoky Pollo en Panca: chicken thighs marinated in smoked panca chilli served with crisp new potatoes, red onion and coriander. It was a very good dish, and perfect for thigh meat lovers. However, I do want to try the other chicken dish we were tempted by on the menu, the Pachamanca Chicken: chicken breasts smothered in a smoked panca and Andean huacatay herb sauce. With our hot food we went for another round of cocktails. I had to drive so from the non-alcoholic cocktail menu I went for the Máncora, a blend of strawberry puree, kiwi syrup, green tea and lime. It is just as bright and funky as it looks, as well as being super refreshing. 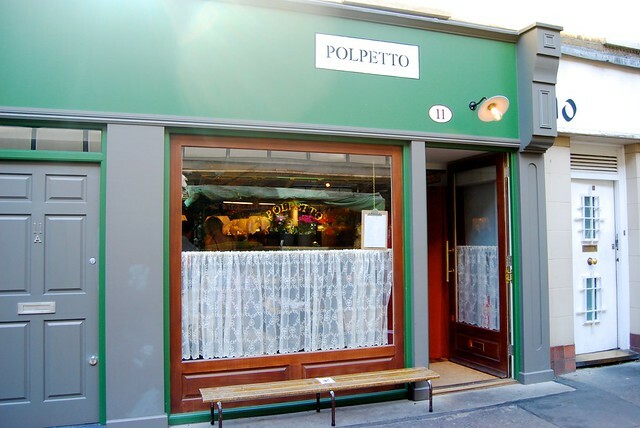 It is one of those great places to go in London if you do have to drive later in the evening; you won’t miss the booze in the options you have available to you. Sherin had the Encuentro Amargo: a cocktail she’d spied on the next table, made with red berries-infused Barsol pisco, Contratto bitter, Tenzan yuzushu, pineapple syrup and lime, with a hunk of pickled pineapple on the side. 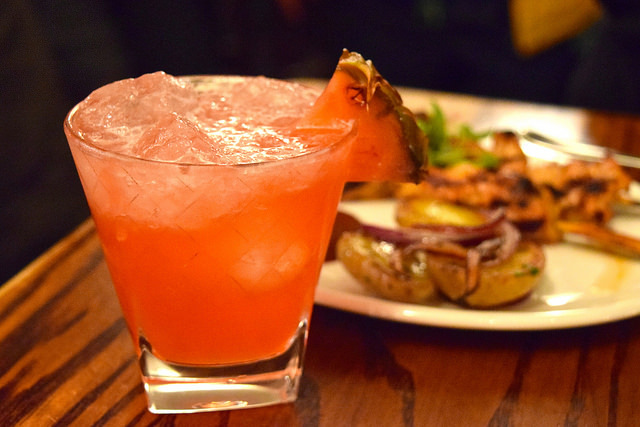 We both adored this one; it is a must order if you like your drinks fruity, but still complex. Finally, as usual, we shared a dessert. 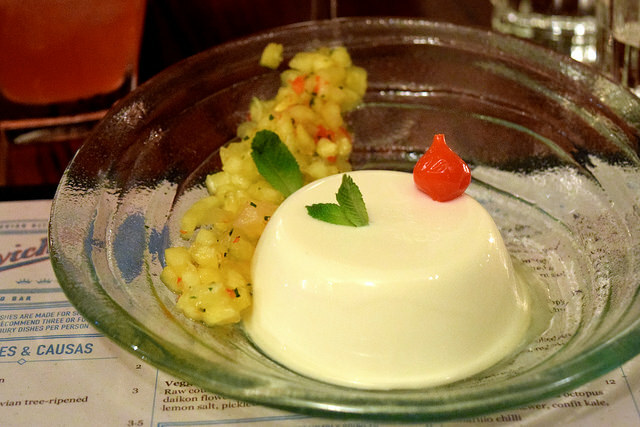 We both rather enjoyed the Pituca Nikkei (Ginger panna cotta made with coconut milk, served with a candied pineapple and roquito salsa criolla). It had the perfect balance of flavour and richness, the perfect end to the meal, and a good one to share if you’re into the two spoons thing. 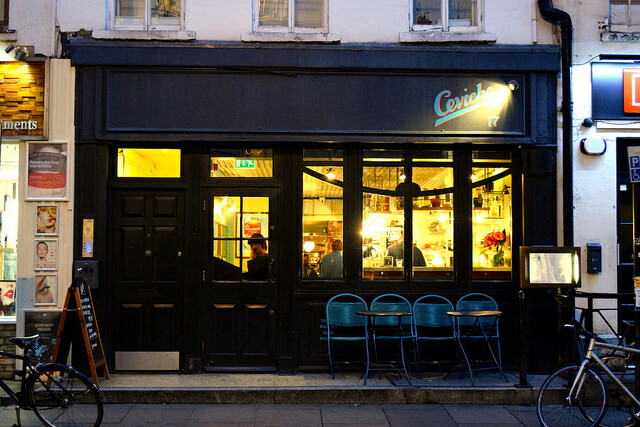 We both really enjoyed Ceviche with its lovely wait staff and buzzing atmosphere, and we’d recommend it to anyone who is in the area and fancies some killer cocktails and great Peruvian food. 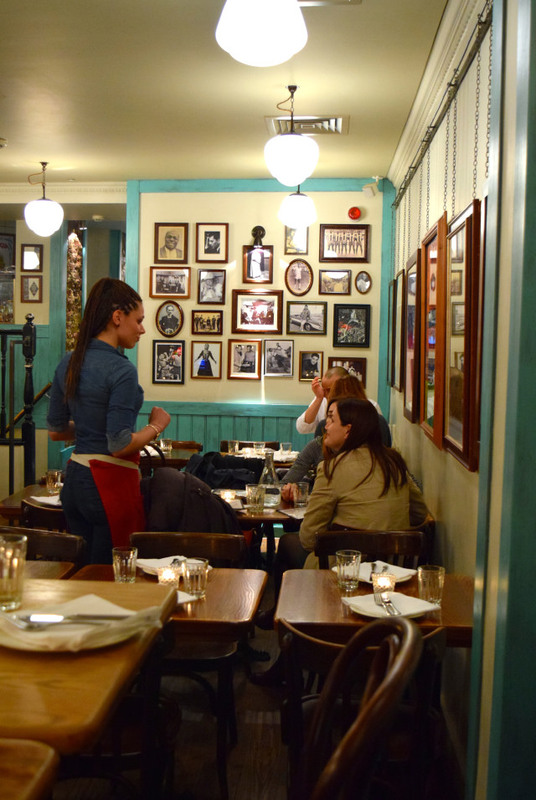 However, I think given the choice, if you have the option of travelling to East London and visiting their Shoreditch sister, you’ll get a meal with all those wonderful Peruvian hallmarks, but with that little bit ‘extra’ that I think Ceviche was missing.